This Shaker High Boy Dresser or "armoir" was custom built at customers request combining two Shaker pieces taken from "The Illustrated Guide to Shaker Furniture" by Robert F.W. Meader. The top half can be seen on page 79, PL.155, and the lower half on page 70, PL. 133. It features six dovetail drawers and two panel doors with three shelves behind. Dimensions are 78" high, 48" wide and 22 1/2" deep. 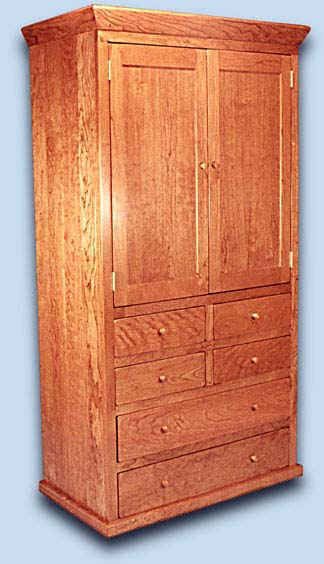 We offer a wide selection of highboy dressers or armoirs with various configurations of doors, drawers, and dimensions. While the dresser shown is solid Cherry, they are offered in all woods.